This is the third installment from Chris Pavone that includes The Expats – Pegasus’ review, The Expats – Urania’s review And then The Accident – Pegasus’ review. As is Pavone’s M.O., once again, we are transported to a world of traveling and European locales. The Travelers is a travel magazine, one of the last in a dying business of print media. Its senior reporter, Will Rhodes, is on assignment in Argentina, when he is approached by a woman who he ends up sleeping with and then being told that he must join the CIA due to his carte blanche access to foreign locations. Yes, I wouldn’t blame you if you had puked whilst simultaneously caused yourself ocular strain by the eye rolling. However, bear with me…. From here, Will is thrust into an espionage world where nothing is what it seems. 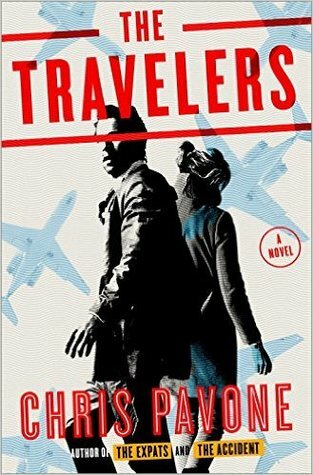 This is not a unique storyline, but with all the different locations, the double crossing, characters who have multiple motives, and fast pace chapters, The Travelers, is truly a fun and exciting read. The characters are good enough (although I feel as though they could have had more room to develop), if not a little one dimensional, but let’s face it, this isn’t type of novel that necessarily requires it. Whilst all three novels are definitely stand alone, Pavone has managed to interweave some characters and plot points that you’ll probably recognize if you read the books in order of publication (The Expats, The Accident, and The Travelers). This books is solidly entertaining and well worth reading if you enjoyed the previous two. 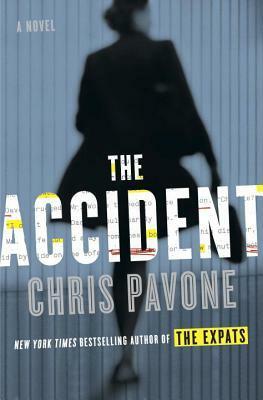 A couple of weeks ago, I reviewed The Expats by Chris Pavone, and this week, I have for you a review of Pavone’s follow-up book, The Accident. 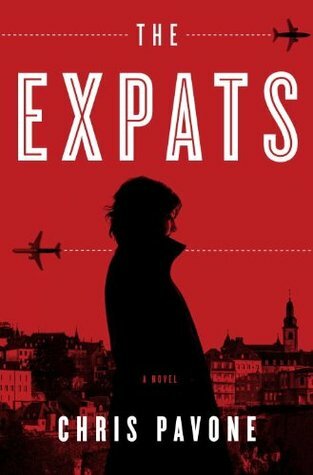 Now, it’s not strictly a sequel per se, but some of the same characters do appear, and you learn a lot more about them, and I would definitely recommend reading The Expats before you read this one. Pavone’s The Accident, is set in the cut-throat and sinking world of publishing. We are sucked into the intricacies and complexities that the publishing business faces on a daily basis, all whilst giving us a meaty thriller. Set over the course of a day (except for flashback scenes), Literary agent Isabelle Reed, is anonymously sent a manuscript and even though it is one of many hundreds she will receive in the week, she makes a copy and passes it along to her assistant, and to an editor to read. The manuscript is an explosive expose on the CEO of a multi media empire. It reveals secrets that are damaging to both the CEO and indeed the CIA. It soon becomes clear that anyone who reads the manuscript is soon in grave danger. As I mentioned in my previous review, Pavone himself is a former editor who has lived in various places throughout Europe. The Accident takes places in Europe and NYC, and because of the author’s previous profession and his expat experience, the story really builds its layers in a successful manner. The pace is taut, the plot exciting – not too far from the realm of believability, and the dialogue is genuine. Pavone has created characters that you really want to either succeed or fail. This is another successful thriller from an author that will soon become as well know and successful as other thriller bigwigs such as David Baldacci. What gives Pavone the edge is his actual experience that he puts in his writing. This book is definitely worth your time and money if you are a fan of the thriller genre. ARC provided by Blogging For Books, in exchange for an honest review. Review – The Expats by Chris Pavone. Can you hear that? Well, that’s a sigh of relief that I am able to write a positive review this week, considering that last week’s book left a lot be desired! This week we have a book called The Expats by Chris Pavone. Set predominantly in Luxembourg and Paris, The Expats follows a family that move to Luxembourg for a career opportunity, and the trouble that soon begins. Kate and Dexter Moore seem to be your average couple caught up in DC’s rat-race, however, Kate is ex CIA with a lot of history. When they get to Luxembourg and begin to mingle with the expat community, Kate soon becomes suspicious of another American couple, and begins to investigate. What follows, will take Kate and Dexter on an exciting, and at times perilous, journey throughout Europe. Is this new couple dangerous? Are things all that they seem? Ok, granted, the premise may sound a little familiar within the countless other novels in the espionage thriller genre, but what gives this the edge is the real experience behind the writing. Chris Pavone has himself been an expat in Europe, and this really shows in the writing. Being an expat myself, I could definitely relate to these characters, their sense of apprehension and that feeling of not being grounded. The pace and tone of this novel was perfect for the genre – not too slow, and not too fast – an intelligent thriller. Thrillers are my go-to for an easy fluff read and this hit the mark. Saying that however, this novel also crossed genre boundaries by examining how people cope in a relationship where secrets rife. In an unknown country, with friends who you can’t necessarily trust, or even a spouse, how do you cope? What runs through your mind? What influences your actions? Well, Pavone attempts to give these questions some answers in the midst of creating an exciting espionage thriller. If you are looking for a fairly quick, but thrill seeking read, then definitely give this one a go, especially with it being only $1.99 at the moment!